Survivors Campus Outreach is more than a missionary experience. We train missionaries to be pro-life leaders. America has waged war on the preborn. The most defenseless among us have no rights, no voice -- they are not even recognized as full human beings. It is our call, as the generation most affected by the evil of abortion, to speak up for those who cannot speak for themselves. It is time to take a stand. Join Survivors Campus Outreach, and make abolishing abortion your mission. The Team. The Campus Outreach Team consists of 5-8 young men and women, 18-30 years old, traveling throughout the United States to introduce the abortion debate to high school and college students on their campuses. Along the way, we also deliver ProLife Presentations & Workshops to groups of youth looking to get more involved in the pro-life movement. Check out our Campus Outreach video! Survivors Campus Outreach challenges students to rethink their position on abortion at over a hundred campuses a year through the use of displays (which include graphic images of abortion, descriptions and photos of fetal development and abortion techniques, and factual consequences of abortion), educational literature and intelligent debate. Thanks to our friends at Human Life Alliance, the Campus Outreach Team also distributes thousands of copies of effective pro-life literature every month. Take a look at HLA's current student publication provided to the Survivors Campus Outreach for distribution. Are you willing to fight injustice and resist apathy? This is your chance to be a courageous ambassador for Christ, reaching out to your peers with the truth about abortion and the message of life! Join the Survivors Campus Outreach Team and see lives saved and transformed through pro-life outreach at high schools and colleges throughout the nation. CHARACTER: The Survivors Campus Outreach Team is looking for young men and women, 18 to 30 years old, willing to commit themselves to pro-life ministry and leadership. 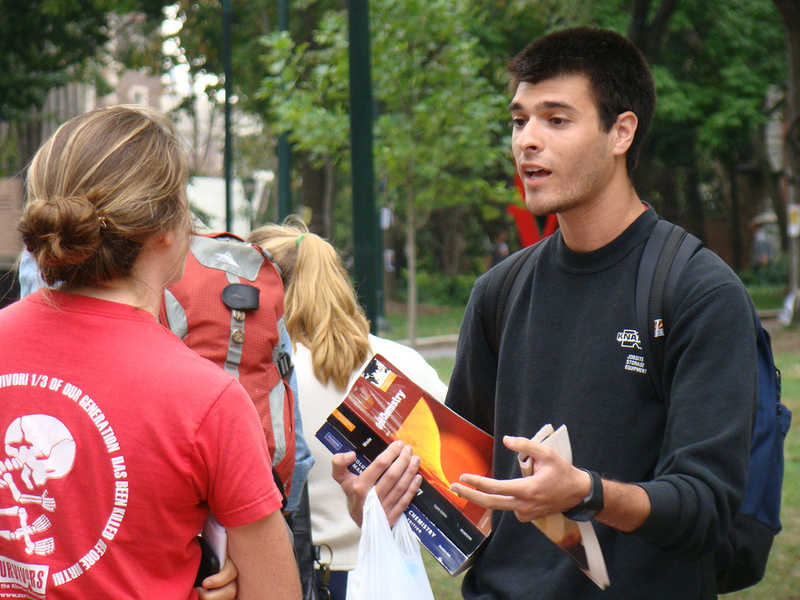 A Campus Outreach team member must be a committed Christian with an attitude of service and a willingness to learn the skills needed to articulate and debate the pro-life position. Survivors Missionaries must work well with a team and be willing to travel. COMMITMENT: You can join the Campus Outreach Team for anywhere between two weeks to a full semester. COST: There is no cost to join the team and accommodations and meals are provided. Travel to Riverside and additional spending money for incidentals will be the responsibility of each individual team member. Team members may want to fundraise to cover for these costs. After we receive your application, we will send you tools to help you with fundraising. How to apply. If you are 18-30 years old and ready for the mission experience of a lifetime, then complete the Campus Outreach online application form now. Contact Survivors Outreach Director, Joe Salant, with any questions about Survivors Campus Outreach. Invite Survivors Campus Outreach to Your Hometown! The Campus Outreach is a key part of the Survivors ministry. We believe that educating our generation is the starting point for building a culture of life in America. We would be glad to help you bring the Campus Outreach to your hometown and visit the local high schools and colleges in your community! For more information, please fill out our online interest form. Everyone, whether young or old, is welcome to join us at any of our campus outreach events! Check out our up-to-date schedule of where we are headed next! If we are not scheduled in your area, please contact us and schedule Survivors to visit your town. Invite the Survivors to speak at your youth group, school, or church! We make it a priority to offer pro-life training and/or activism to individuals and groups wherever the Campus Outreach visits. This is a great way to get your pro-life group or church involved with solid training in apologetics and pro-life outreach! Check out our ProLife Presentations & Workshops. Schedule a Meet & Greet with the Suvivors Team! Meet & Greets are a fun and informal way for our supporters to invite their circle of friends to meet the team while they are on the road and hear about the work of Survivors. Team members will share stories from the road, testimonies from on campus, and answer any questions about their life-saving work while enjoying a meal, dessert, or even just a few cups of coffee. We ask the host to take an informal love offering sometime during the evening. These love offerings are a blessing to the team and they help keep this powerful pro-life outreach on the road. Yes! I would love to schedule a meet and greet with Survivors! "Keep up the great work that you do in your campus outreach defending the unborn. I have been doing sidewalk counseling for over 20 years at abortion mills and realize that the pro-choice mentality does not start at the door of the killing center. Educating young people is one of the keys to solid pro-life work. You are saving babies by teaching that mothers and fathers should respect life and never even think about having their children murdered by abortion."